Shamila Kohistani’s life transformed when she picked up and played with a soccer ball. Shamila has six sisters and one brother and playing with her brother on the football field became one of her hobbies. She became the one to defy all the norms that girls have to abide-crafting a goalpost out of rocks and playing football with children her age who were mostly boys, rather than dolls. 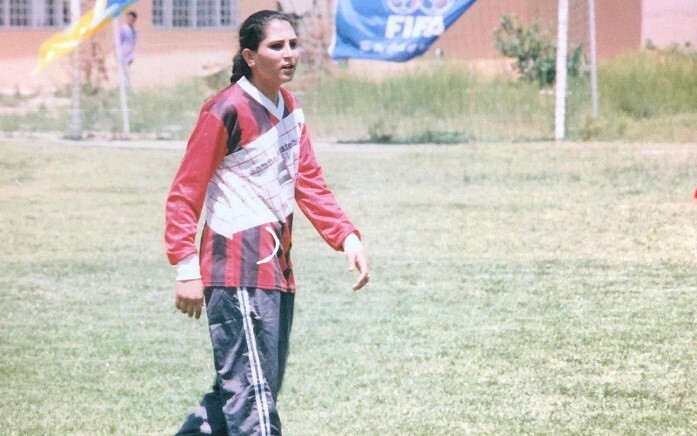 Football did not garner much interest in Afghanistan during Shamila’s childhood and adolescent age; there were neither any green fields to play on nor any goals, neither a criterion for the weight of a ball, nor referee and a whistle to play. There are still few sports that can be played with very basic and small paraphernalia or equipment in every situation. After the fall of the Taliban, football was one such sport as all it took to play were the soiled fields and earthy grounds in the ruins of the city with a simple ball and rock-made goal. Unlike her other sisters, Shamila did not enjoy playing with dolls and she instead loved to play soccer with her brother who is a year older to her. Perhaps Shamila never fathomed that soccer would take her to one of the largest continents in the world and enable her to have the sort of experience and exposure which was different from that of her peers. Shamila has not easily achieved the successes and colourful world of her life. She lived her childhood under Taliban rule which cast a heavy and dark shadow over the majority of Afghanistan. Her father Abdulwara was an officer in the Afghan security forces of the time and always traveled from city to city to discharge his duties. On one of these trips to Ghazni, his daughter, Shamila, was born. After a while, they traveled to Bagram, where Shamila was an elementary school girl, but she could not attend school when the Taliban came in. Not only did the Taliban keep her away from her aspirations, but they also compelled her to flee from Shamila’s family lived. Everything changed in this family; a father who was once a security officer is out of office and was making ends meet to keep his family safe. Shamila’s family moved from Bagram to Kabul because Bagram was inhabited almost by no one and everyone fled somewhere else. But they did not have a place to live in this city. Shamila’s family originally are from Kohistan district of Kapisa, and their only asset was the property and land that they had in the district. Despite this situation, Shamila’s father had to settle with his family in a house in Kabul. Abdulwara came to Kabul with a vague future in fear of losing his children, and life getting harder than it already was. The head of the family who had to work now and feed his children got a barrow to sell potatoes for a living, but the more he tried the less he succeeded. He then went to Iran in search of better work. Abdulwara’s family stayed in Kabul meanwhile, and eight female members of the family and the son started to weave carpets in order to be able to help their father. Abdulwara’s daughters, who were passionate to study and live differently from their past faced a testing and difficult period. Fear of the Taliban, distance from father, paucity of money and food- all these factors persuaded Shamila and her sisters to work harder so as to contribute towards making a living along with their father. Sadly, their father could not survive in Iran, and returned to his country after a year. At the same time, two elder sisters of Shamila learn to make embroidered burqas (Chadari), and they all commited themselves in the work . Once their father returned home, the responsibility of making ends meet fell on the daughters, which became another another phase in the struggle of a family to live and survive in Afghanistan. The members of the Shamila’s family in Kabul, like all other citizens under the Taliban rule, lived their lives until one day, Shamila went to the “Lese Maryam” marketplace in the north Kabul with her mother, a market which is still one of the capital’s bustling shopping center. But while returning during noon azan, the Taliban happened to be forcing everyone to perform the prayer while Shamila and her mother were struggling to rushing towards their house by trying to reach a lane from the main street. But luck was not on their side that day, and as Shamila was running, she tripped on the ground and her burqa was separated from her body; which led her to be flogged by Taliban members. After enduring the whips, Shamila and her mother managed to escape and get rid of the Taliban that day. This horrific incident happened just a week before the fall of the Taliban government in Kabul. “I sometimes joke with my mother telling her that my prayers were answered, if they did not flog me, this would have never happened to them.”Shamila is a lively and kind girl who has been able to receive excellent education and realise many of her dreams with the support of her parents. As the Taliban rule collapsed and Shamila returned to the social environment, she studied and followes her childhood dream. Gradually, she formed a team of girls who all wanted to play football. These were the girls who sought to break the social taboos by playing football. 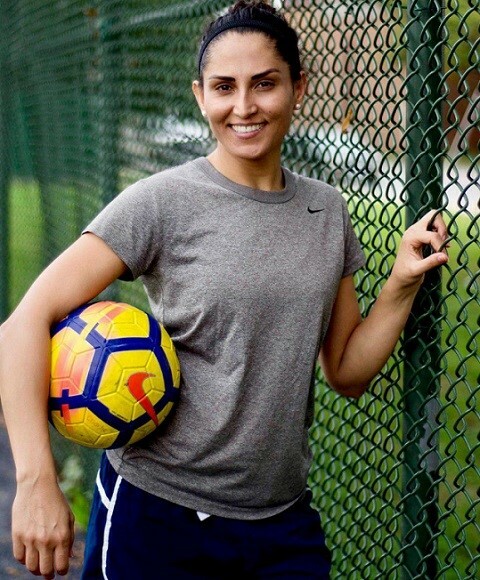 Football opened up another horizon in her life, thus enabling Shamila and her teammates to travel to the United States as the first Afghan female footballers. Shamila met new people in the United States when she won Arthur Ashe Courage Award in 2006. She was the captain of Afghan National Team until she received the award and her new life began. Although she returned to Afghanistan with more enthusiasm and continued her training, an educational opportunity was provided for her in the United States. She was invited to continue her studies at a school in the United States. This request was very difficult to accept; in the land where the girls were forgotten, and she was struggling to introduce herself to the community, she was invited too far beyond the borders of Afghanistan to get education and give her the chance to achieve her dreams. She loved football, and if she were given the right to decide, she would certainly accept field and ball, but this time she was not on her own and her father took the final decision, a father who gave priority to his daughter’s education. How hard and frustrating it was for Shamila to leave everything that she was building and to go to a new country and environment. 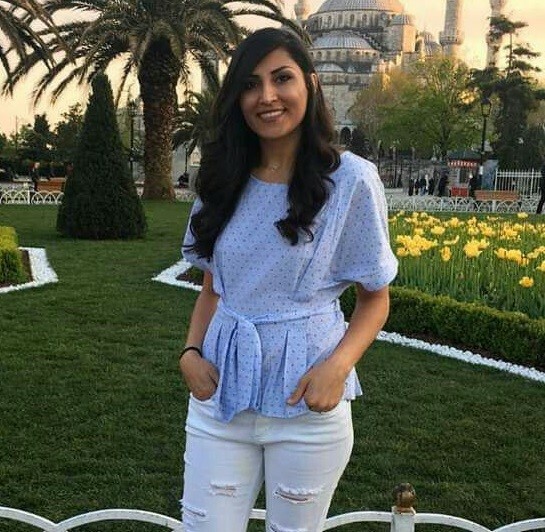 For someone who had completed the eleventh grade at Maryam High School, she ended up completing her twelfth grade in one of the American schools. It was too late for her to apply for college and pursue her education, therefore, she returned to Kabul, and after two months she received an acceptance e-mail for her bachelor’s degree from a university in New Jersey. She returned to the United States to continue her studies and graduated in political science in 2012. In addition to political science, she also pursued women studies. The 30-year life of Shamila has had many ups and downs. With the memories of happiness and sadness and with a past which was formed as a result of several days and nights of struggles; it was a past that brought her a bright future. 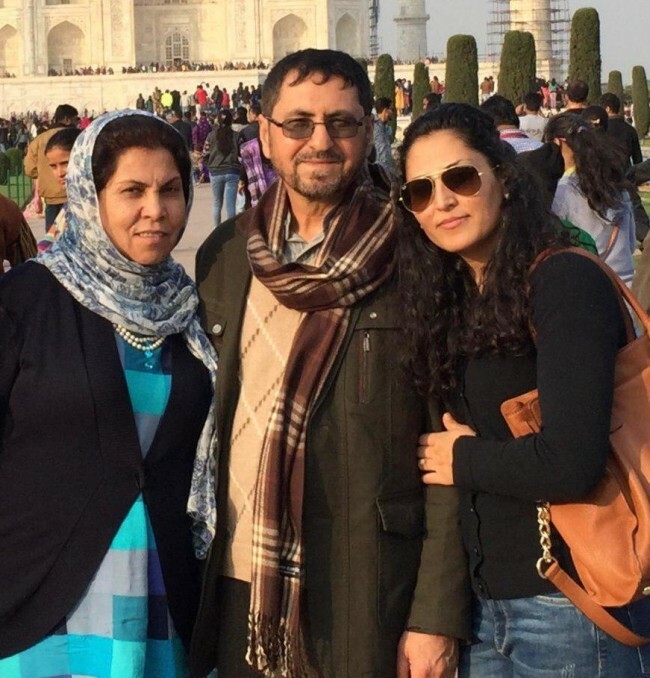 Her family still lives in Afghanistan, and she has been a traveler for a decade, although she has come to Afghanistan several times to visit her family. She has been a footballer since 2004 and was one of the first girls to play football at a time when there was no female team or women’s Committee in the federation; but she never gave up on playing football. Despite the fact that she played football only at the University in the United States, she has managed to follow her childhood dreams even at the lowest level. Shamila Kohistani was the first captain of the national women’s soccer team in Afghanistan who left the game after her knee surgery, but speaking to girls from American schools she has narrated the story of the lives of Afghan women footballers, a story that she herself is part of that and she owes her present life to soiled fields of football and the pursuit of her childhood dreams. The football game has made her a strong, fighter, confident and different girl. 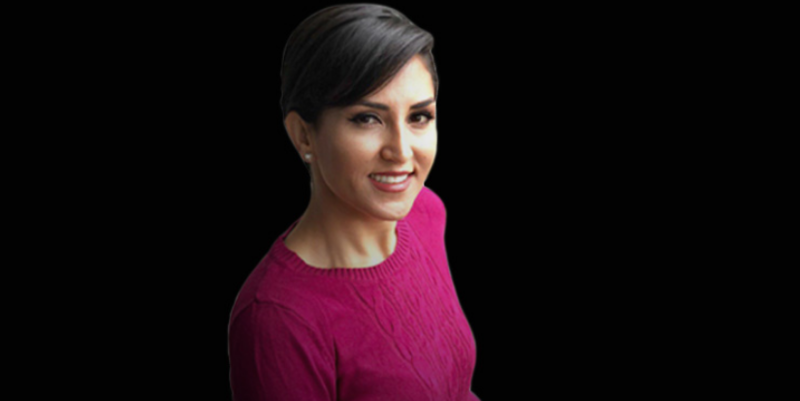 Now, Shamila Kohistani is working in a non-governmental organization focusing on the development of nongovernmental institutions, and her field of work is the Middle East. 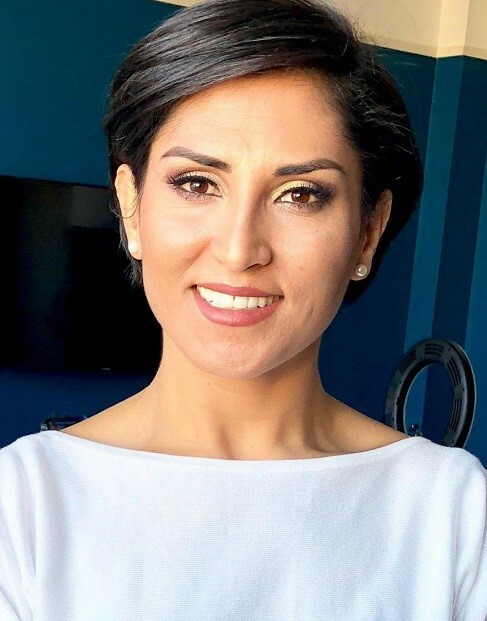 This inspirational story continues and Ms. Kohistani seeks to help other girls in her homeland meet their dreams; girls who are now in the midst of instability and a vague future after seventeen years of international presence and serious support. Ambiguity of the fate of half of Afghanistan’s society in peace process and the return of the Taliban is associated with bitter memories and dark days of whips and chains.